ALDERGROVE, BC – Dead Frog Brewery has announced the release of a new autumn/Hallowe’en seasonal that is being half-jokingly referred to as “not another pumpkin ale”. Our Weeping Reaper Blood Orange Helles Bock is designed for the transition from summer to winter – a bit more alcohol warmth for the cooler nights, yet lighter bodied and more carbonated than a hefty winter warmer. Premium European malts and hops result in a brew that’s light in colour but not in body, with a perfectly balanced finish. 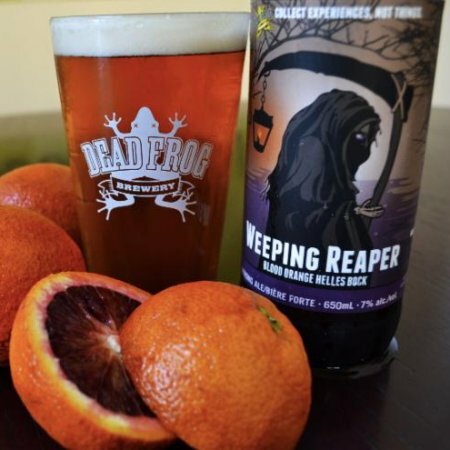 Clean-tasting and malt-forward with notes of sweet orange, the Weeping Reaper is a fresh seasonal alternative for those not enamoured with the orange autumn gourd. Weeping Reaper is available now in 650 ml bottles at select private and government liquor stores in British Columbia while supplies last.